blooms in late summer and fall. or highly-tolerant to powdery mildew. Lagerstroemia fauriei - Japanese Crepe Myrtle, Yakushima Crepe Myrtle - Tree - From 30- to 50-foot, multistemmed trees with extraordinary, peeling, orange-red to dark-red to brown bark. Produce white flowers, and vivid red-orange fall foliage and are very, cold-hardy. Lagerstroemia fauriei 'Fantasy' - 'Fantasy' Crepe Myrtle - Tree - A 50-foot, multistemmed tree with extraordinary, peeling, orange-red bark. It bears white flowers, has red-orange fall foliage and is very, cold-hardy. Lagerstroemia fauriei 'Kiowa' - 'Kiowa' Crepe Myrtle - Tree - A 30-foot, multistemmed tree with outstanding, peeling, orange-red to dark-brown bark. 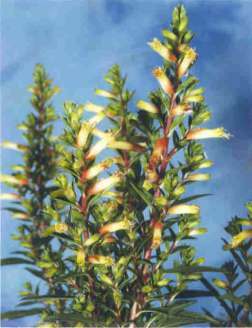 It produces white flowers and has red-orange fall foliage. Lagerstroemia fauriei 'Townhouse' - 'Townhouse' Crepe Myrtle - Tree - A 30-foot, multistemmed tree with extraordinary, peeling, dark wine-red bark. It bears white flowers, has red-orange fall foliage and is very, cold-hardy. Lagerstroemia indica 'Centennial Spirit' - 'Centennial Spirit' Crepe Myrtle - Shrub - It bears the darkest of wine-red blooms and can eventually reach 6-feet-high. This powdery-mildew-resistant, very, cold-hardy, dwarf shrub has red-orange fall foliage. Lagerstroemia indica 'Velma's Royal Delight' - 'Velma's Royal Delight' Crepe Myrtle - Shrub - A slow-growing shrub to 6-feet-high and -wide with dark-magenta to brilliant- purple flowers. It is one of the cold-hardiest, powdery-mildew-tolerant clones of L. indica. Lagerstroemia indica X fauriei 'Acoma' - 'Acoma' Crepe Myrtle - Shrub - A large pure-white-flowered shrub with weeping branch tips to 12-feet-high by 10- to 12-feet-wide. It bears a light-grey bark and dull-red to dark-purple-red fall foliage. Lagerstroemia indica X fauriei 'Biloxi' - 'Biloxi' Crepe Myrtle - Tree - An outstanding and very cold-hardy National Arboretum selection with pale-pink flowers. It typically forms a multistemmed tree 25- to 45-feet-high. The mottled bark is like the native Madrone Tree, smooth and dark, reddish-brown. Its fall foliage is dark-orange to dark-red. This tree can grow seven feet in one year. Lagerstroemia indica X fauriei 'Chickasaw' - 'Chickasaw' Crepe Myrtle - Shrub - The first true miniature, highly-mildew-tolerant hybrid crepe myrtle. A container-grown plant has reached 20-inches-high and 26-inches-wide after 7 years. Its dark-red buds open to pinkish-lavender blooms. The leaves are tiny, glossy and dark green and produce bronze-red fall color. Lagerstroemia indica X fauriei 'Comanche' - 'Comanche' Crepe Myrtle - Shrub - A large shrub to 12 feet with a spreading habit and a light, sandalwood-colored bark. It produces dark, coral-pink flowers over a long season and has spectacular dark, orange-red to dark, purple-red fall foliage. Lagerstroemia indica X fauriei 'Lipan' - 'Lipan' Crepe Myrtle - Shrub - A 14- to 16-foot-tall, large shrub with near-white to beige mature bark which bears medium lavender flowers. Its fall foliage ranges from light orange to russet to red. Lagerstroemia indica X fauriei 'Miami' - 'Miami' Crepe Myrtle - Tree - This hybrid produces dark-pink to coral-red flowers. It can reach 15 feet, or more, as a multistemmed tree or 25 feet if trained to one trunk. The exfoliating bark is dark, chestnut-brown. Fall foliage color ranges from orange to dark-russet. Very, cold-hardy, if acclimated. Lagerstroemia indica X fauriei 'Muskogee' - 'Muskogee' Crepe Myrtle - Tree - This selection is from the original generation of hybrids produced at the National Arboretum. It has lavender flowers and can reach 25- to 40-feet-high. The attractive mottled bark is a medium-brown. Its fall foliage ranges from red to yellow. Lagerstroemia indica X fauriei 'Pocomoke' - 'Pocomoke' Crepe Myrtle - Shrub - A true miniature with deep-rose-pink flowers and high mildew-tolerance. A container-grown plant has reached 19-inches-high by 35-inches-wide in 8 years. Lagerstroemia indica X fauriei 'Sioux' - 'Sioux' Crepe Myrtle - Shrub - An upright, tall shrub or small tree 16- to 18-feet-high, bearing intense, dark-pink flowers. Its mature bark is a light to medium grey-brown and its fall foliage is light maroon to bright red. Lagerstroemia indica X fauriei 'Tonto' - 'Tonto' Crepe Myrtle - Shrub - It bears deep, fuchsia-red flowers and stays 6- to 8-feet-high, with an upright habit. The mature branches peel to reveal a cream- to taupe-mottled bark. Fall foliage is bright-maroon. Lagerstroemia indica X fauriei 'Tuskegee' - 'Tuskegee' Crepe Myrtle - Shrub - This 12- to 16-foot-high shrub can also reach 16-feet-wide because of its pronounced horizontal branching. It bears dark-pink to nearly-red flowers and has orange-red fall foliage. Its bark is a mottled light and dark grey, identical to that of the Native Persimmon. Lagerstroemia indica X fauriei 'Yuma' - 'Yuma' Crepe Myrtle - Shrub - This upright, large shrub with bicolored light- to medium-lavender flowers can grow 16- to 20-feet-high. It bears a mottled light-grey bark and produces dull, yellow-orange to russet to light mahogany fall foliage. Lagerstroemia (indica X fauriei) X L. limii 'Arapaho' - 'Arapaho' Crepe Myrtle - Shrub - A large shrub or small tree to 20-feet-high with near true-red blooms. The smooth bark is light tan and the glossy, dark-green leaves are tinged with maroon. Lagerstroemia (indica X fauriei) X L. limii 'Cheyenne' - 'Cheyenne' Crepe Myrtle - Shrub - A large shrub to 10-feet-high and wide bright red flowers. The smooth bark is a light reddish-tan and the glossy, dark-green leaves are tinged with maroon.